Conuma Coal Resources was founded to be a contributor, positive influence and supporter to our community. We are committed to earning security for all of our partners, and to unifying resources and people to build a “first class” organization recognized for character and true integrity. The health and safety of Conuma's employees is a value that shall never be compromised. We believe that all incidents are preventable and that the goal of "zero incidents" is achievable through training, preparedness and a company-wide culture of safe work practices. Conuma is focused on providing security for all our partners. "Security" ranges from our customer's confidence in the quality and reliability of our products to the financial well-being and career security for our employees and their families. As a citizen of the beautiful twin towns of Tumbler Ridge and Chetwynd, Conuma is committed to becoming an asset to the local community in Northeast British Columbia. We are a partnership of families, communities, investors and our four First Nation bands joining together to build security. Conuma’s operations in the Peace River Coal Field have established a reputation in the global steelmaking sector for the highest quality metallurgical coals. Conuma’s pulverized coal injection (“PCI) and hard coking coals (“HCC”) are sought by steel producers and coke makers in Asia, North and South America, and Europe. We take our responsibilities seriously. Conuma is committed to supporting the families, charities and businesses of our local communities and selected causes globally. Our operations, producing some of the highest quality metallurgical coal resources available anywhere in the world, are paired with an unrelenting dedication to Total Quality Management, and a logistics chain to ensure reliable and competitive delivery of our products to the global steel industry. We work collaboratively with industry regulators and local communities to ensure that Conuma is regarded as a responsible steward of the environment. All mining operations are undertaken under strict compliance standards and our end-of-service redevelopment initiatives ensure we leave the land with as little impact as possible. Our employees and customers are partners – Conuma’s success will only come as a result of teamwork. As a diverse, yet close-knit workforce founded upon respect we strive to ensure everyone understands the importance of their part in our shared success. By avoiding injuries, violations, delays, rework and waste, security is earned. Conuma employees, families, communities, the environment and stakeholders all win. With large investments in machinery and infrastructure, matched with an expert team of operators, we focus on the elimination of waste and increase of throughput throughout all stages of extraction, processing and delivery. 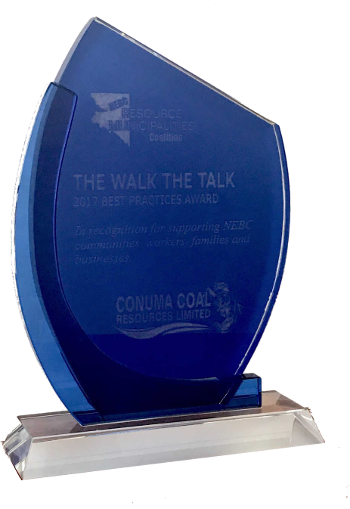 Conuma's Wolverine Mine is the proud recipient of the 2019 Edward Prior Award, presented at the Government of British Columbia’s 57th Annual Mine Safety Awards in Victoria. Conuma Coal Resources is pleased to announce a multi-year investment in safety technology solutions offered by Hexagon Mining.